Tonnages: 13,600 gross, 7.680 net, 21,150 deadweight. Engines: Two 9 cylinder Ruston & Hornsby medium speed oil engines, 12000 bhp, 15 knots. 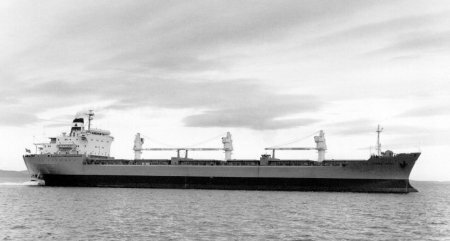 November 1969: Completed by Marinens Hovedverft, Horten (Yard No. 166) for Euxine Shipping Co. Ltd., London. (Lambert Brothers [Shipping] ). Scottish Ship Management Ltd., Glasgow, managers. 1973:	Re-engined by Amsterdamsche Droogdok Maatschappij, Amsterdam, with two 9 cylinder Stork-Werkspoor 9TM410 Diesel engines, 12,000 bhp, 15 knots. 1975:	Management transferred to Whitco Marine Services Ltd.
1978:	Sold, Jacamar Shipping Co. Cyprus flag, renamed SOLITAIRE. 1988:	Sold, Silver Dolphin S.A., renamed GHADEER, Panama flag. 1993:	Sold, Royal Kris Maritime S.A. renamed ROYAL KRIS, Panama flag. 1994: Left Inchon 6th August for ship breakers in China.